Tenants Harbor is located east of the St. George River just north of Hart Neck and south of Long Cove. Geographically speaking, Tenants Harbor is 17 miles southwest of Vinalhaven Island and 59 miles northeast of Portland. The image above is a view from the east looking west over the opening to Tenants Harbor where it empties into the Atlantic Ocean. Off to the left (south) is Hart Neck, while the fringes of a rock ledge near the passage north to Long Cove can be seen off to center right. Off in the distance on the horizon, the St. George River can be seen working its way north toward the town of Thomaston. 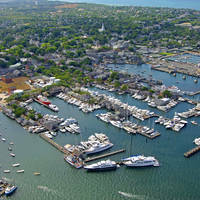 As of this writing the town of Tenants Harbor reports that there is no anchoring allowed in the town harbor. If you want to drop the hook, you can do so outside of the mooring fields, or head up into Long Cove, which is just north of red nun buoy 2 on the approach. There are no real transient slips in town, but you can fill up with both gas and diesel fuel at Cod End Market. Tenants Harbor Town Dock administers the moorings in the harbor. 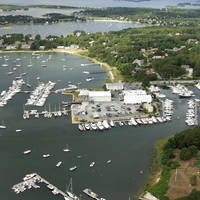 Tenants Harbor is reached via an approach from the east through the Atlantic Ocean south of Long Cove and Clark Island. Approaching from the east or south, first set a course for flashing green buoy 1, which is located at an approximate waypoint of N43 57.693 W69 10.879. Once you have safely navigated to flashing green buoy 1, pass it decidedly to port, and then head west into the harbor area. Note: If you are approaching from the east, make sure to mind red nun buoy 2SB, which marks a rock ledge south of Whitehead Island and farther on to the west, green nun buoy 1. If you are approaching from the south, be sure to keep an eye out for green nun buoy 1, which marks the location of Hart Ledge, about one mile south of Southern Island. No reviews yet! 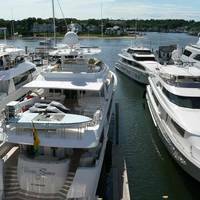 Be the first to write a review of Tenants Harbor Inlet.